Article prepared by Mark Roddy, co-founder of Coin Hunter Research Group. Recently, there has been a lot of discussion about token models. Some investors have lost faith in utility tokens, but this is due to the wave of ‘utility’ ICOs in the last 12 months that really had no utility what-so-ever. The reality is, that well-designed token models still have the power to transform economies and industries especially when governance, access and reward incentives are involved. Tokenomics has been at the core of Emanate’s design and much time has been spent deliberating over how the mechanics of this ecosystem will work. Emanate partnered with the Coin Hunter Research Group to help define the token economy and hopefully after reading this you will agree that what we have developed is a significant step forward in token models within the crypto space. Firstly, let's define what a token model is for those that are less familiar with the concept. Token models are akin to Business models. Business Models define how a business creates value for a customer base whilst capturing value via profits for its shareholders. Token models are different in the sense that we are trying to drive value into the token oppose to extracting value via profit. I like to use William Mougayar’s definition of a token to help explain what a token is. Token models have the ability to transform business models and create an ecosystem which encourages value creation over value extraction and this has been the underlying principle in the emanate ecosystem. To reward the value creators. Why not just use existing models? Emanate could have very easily adopted token models of its competitors. However, after a careful review of music focused projects in this space, it became clear that all had fundamental flaws in their designs and therefore a completely new model would need to be created. What were the flaws? Currently, almost all token models make use of a single token economy, which ultimately we landed on would be a very poor user experience for a protocol used as frequently as what a global audio exchange protocol would be used. Cryptocurrencies are without a doubt volatile, however, this has to some extent become a defence by teams to justify poorly thought-out token designs. Single token economies accentuate the volatility and in turn create a poor user experience. Let’s go through an example of a music streaming platform. And let’s assume that the song you want to listen to is priced in the projects token. You play a song and you pay X number of PLAY tokens. Now again let's assume that the price of PLAY tokens jumps 80% because of a rumour on the market. This is great if you’re are holding PLAY tokens but the reality is that you’ve probably just overpaid significantly for the song you were listening to on repeat last week. Alternatively, if the price of music if priced in USD and the amount of PLAY tokens fluctuates based on the price of PLAY we can end up with a worse situation where someone is holding what they thought was a month’s worth of PLAY tokens only to wake up the next day and the price has fallen off a cliff and they are left with a few songs in credit. I.e This type of token model doesn’t encourage the use of the platform but rather speculation of the success of the platform and inherently leads to a poor user experience for the listener and the artists. Which ironically means that the platforms will not succeed and the speculators will lose out. To add to that, in all single token economies you force customers into somewhat the role of a shareholder; that is, they are essentially investing in the platform, which could be fine for some projects but if you are just listening to music on your morning run do you really care how successful Spotify or whatever streaming app you are using actually is? No. You use it because you like it. We define these types of listeners in the emanate model as passive listeners and thus far they have not been catered for in token designs for music-focused projects. In a similar vein artist suffer much the same fate, they just want to create music and not care about whether the money flowing into their account will be worth more or less tomorrow. Ultimately, single token economies for something like music results in a very poor user experience for users of the platform. The music industry is made up of many actors, so it was paramount that the token design first encouraged participation and aligned incentives of all those actors but was also sustainable, adaptable and would scale within the music industry indefinitely. After many iterations Emanate put forward a two-token model. EMT is the token that is required to extract value out of the ecosystem. This means that if a Record Label, Artist, Music curator, Node operator wanted to earn an income for providing a service within the network they would need to stake the EMT token themselves or at least use the services of someone staking to earn MNX. For example; An artist that is not interested in staking would need to utilise a service of say a record label who would stake their music possibly for a fee from any rewards earned via their music. or an artist may not be able to afford to stake and would negotiate a fee with a service provider, in time the artist could earn enough MNX and convert to EMT to stake. This does two things very well. Firstly, it caters for the actors in the ecosystem that are not interested in the Emanate Platform but wish to utilise its services. A small fee is negotiable and both the service provider and artist are happy. Secondly, for those that wish to stake EMT and receive the full rewards, it aligns their incentives to that of the Emanate platform. Or to put this another way, those that are likely to extract the most value from the Emanate platform must stake EMT and in doing so are inherently incentivised to provide value to the Emanate platform or lose value on their staked EMT. To demonstrate the power of this, let us walk through some examples. A tastemaker that puts playlists together for their fans monthly adds significant value to the Emanate ecosystem and should be rewarded accordingly. However, to earn MNX this person would need to stake EMT. If the music curator draws more people to the platform this naturally drives up the value of their EMT. i.e. they want to ensure that they offer a valuable service to their audience. If an artist wishes to upload their music to monetise, they must stake EMT. If that artist was to continually flood the Emanate platform with poor quality sounds, firstly the sound parts would not be utilised by other artists and result in little to no income, further by not adding value to the network or detracting value from the network this would, in turn, lower the demand of the Emanate platform and therefore the staked EMT. Again, it is in the best interest for the sound maker to add value to the network to earn more MNX but also increase the value of their staked EMT. Interestingly, this token model encourages what would be previously be seen as competitors to work together. Record Labels that both utilise the Emanate platform to store and distribute their artist's songs may well be in competition on a day to day basis. However, given the fact that both record Labels are required to stake EMT they are incentivised to again add value to the Network or risk devaluing their EMT tokens. This incentive mechanism of rewarding those that add value can be extended to the broader community who might hold EMT tokens themselves or provide services for income via the Emanate’s Future development fund and therefore are ultimately encouraged to make the Emanate platform the best it can be. MNX can be simply thought as the accounting system of the emanate platform. In its simplest form, an individual listening to an artists music is receiving value and therefore there should be an exchange of value in return; MNX allows that transfer of value to occur. MNX is stable because it is minted as demand rises on the emanate platform and burned as MNX leaves the platform. This elastic money supply creates a stable revenue stream for artists whilst also catering for the passive listeners who need not worry about the daily fluctuations of their utility token. Additionally, transaction fees on MNX when it is cashed in and out of the ecosystems is what created a rewards pool for those who support the network: IPFS node holders, play-listers, moderators… even a referral program for Emanate reps.
EMT holders will also be able to govern the Emanate platform completely in time via voting on proposals for the platform. 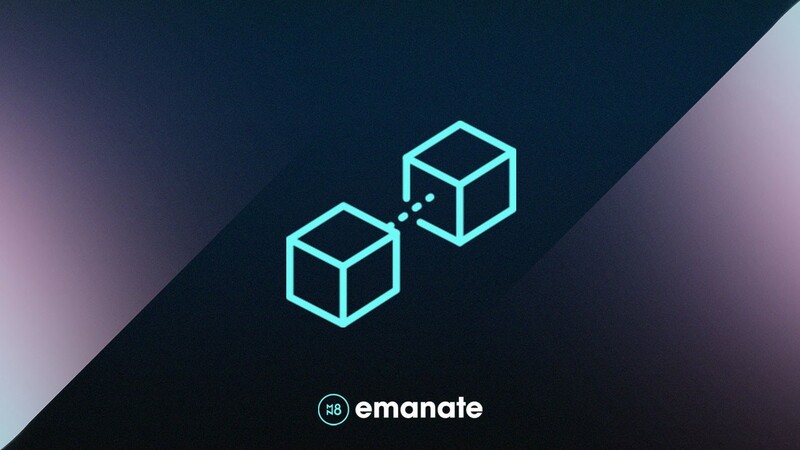 Emanate will eventually become a fully Decentralised Autonomous Collective and because we encourage actors who extract value to stake EMT this means that a much broader community of stakeholders will be able to vote on the emanate platform rather than a few “shareholders” which can occur in a traditional corporate structure. i.e. musicians will actually be able to have a say to what happens in the music industry. This is yet another incredibly powerful concept once fully understood. Token holders will vote on proposals that range from development work, marketing campaigns, change in governance protocols all with the intention of making Emanate better, driving more users to the platform and more value to the EMT tokens. Any project that completely understands the power of decentralised economies realise that their token should not be just a currency but rather an economy. An economy that is structured to incentivise and reward all participants in that ecosystem that add value. We believe that we have created a completely sustainable, scalable token model that combined with the technology that Emanate and EOS offer will transform part of the music industry into the blockchain era.